It’s a series we’re calling “Dishing Up the Holidays.” So far we’ve heard about chile roasted turkey and mac and cheese. 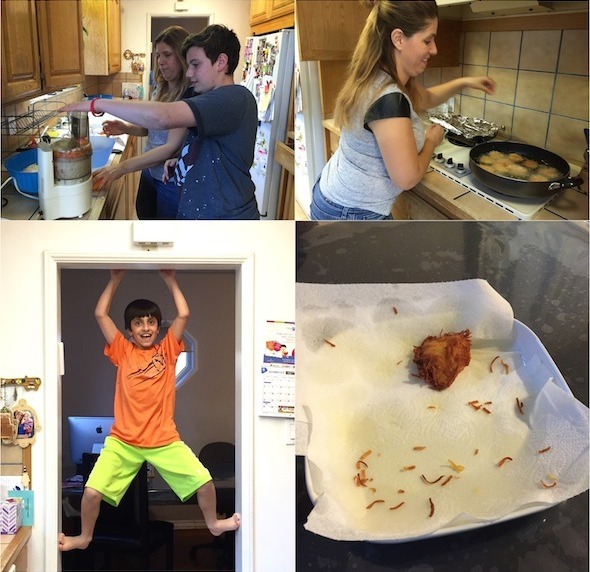 This week, we take a look at latkes. Ricki Kaminski is a realtor and avid home cook. She lives with her husband and three children in the San Fernando Valley. She’s cracked the code for how to make a great Hanukkah latke. Put shredded onions and potatoes in a bowl. Add eggs and blend in. Then mix in flour, followed by bouillon powder, and salt and pepper to taste. Take a handful of the potato-onion mixture at a time and squeeze out the moisture until you can form a patty that holds together. Towards the end of the batch, the potato-onion mixture may get runny. You can put it in a sieve to help drain off the excess moisture. Use a large frying or saute pan so that the latkes won’t be crowded. Pour 1 ½ to 2 inches of oil in the pan and heat over medium high. Ricki says you can test to see if the oil is hot enough by putting one shred of potato in the pan. If bubbles form around it, you’re good to go. Add the latkes, and once the first batch is in the pan, turn down the heat immediately. You want to make sure the inside gets cooked, as well as the outside. After 5 to 6 minutes, turn the heat back up to medium high to high. Turn the latkes over when they’re brown around the edges. Cook for another 5 to 6 minutes until the latkes are golden brown, then remove from the pan and drain on paper towels. Serve immediately, with sour cream and apple sauce.